To quote the great Gil Scott-Heron ‘the revolution will put you in the driver’s seat...the revolution will not be televised...the revolution will be live’. Media has changed beyond measure since this iconic protest poem was written by Scott-Heron in the 1960s – now we have Twitter, Facebook, Instagram and online petitions it is technically possible for us to campaign via the wonders of the world wide web from the comfort of our own couch. The powerful sentiment of Scott-Heron’s verse still rings true however; if we want something to change, we have to get up off our proverbial posterior and do something about it. It just so happens that now we have even more ways to rise up and make ourselves heard. 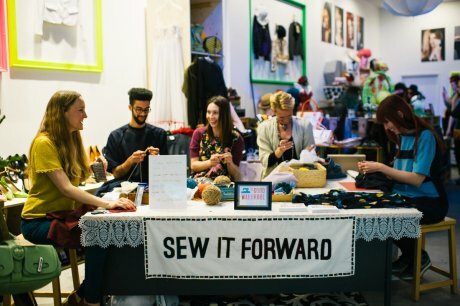 Last month’s Fashion Revolution Day on 24th April, which marked one year since the Rana Plaza garment factory collapsed killing 1133 people, proved just how firmly we are in the driving seat. On the day itself, ‘Fashion Revolution’ received 6.6million hits on Google, and the campaign slogan #insideout trended globally for hours on Twitter (over-taking ‘One Direction Day’ with ease). Fifty eight countries got involved and thousands of us marked the day by putting on our clothes inside out, taking a photo and Tweeting it, asking the all important question, ‘Who made my clothes?’. The idea behind this was to begin to think about where our clothes come from, engage others in conversation and in particular, to show retailers that we all care about the people that make our clothes, in the hope they would respond. To say many fashion brands monitor their social media channels closely would be an understatement. H&M experienced a PR embarrassment this week after one of their staff accidentally forwarded a confidential email conversation to Julien Pain, a man who had written a report on what he described as 'the grim working conditions and very low salary of the Cambodian workers that produced H&M clothing'. Pain published the offending email, and whilst it doesn’t prove H&M were having clothes produced at Rana Plaza, it does show just how concerned the brand is with their social media reputation. Ergo, we have the power. On 24th April a number of organisations unconnected to Fashion Revolution Day chose to mark the one year anniversary of the Rana Plaza disaster with a peaceful protest. Activists chained themselves to Benetton in Oxford Circus - a comment against the brand’s refusal to pay compensation to the people who were injured or lost a member of their family when their workplace collapsed (following the tragedy, Benetton claimed no involvement with the factory but soon after a photograph of their clothing in the rubble made headline news.) Not only was the store closed for the rest of the day, but, after people were encouraged to tweet the brand with: ‘@Benetton please #payup for the victims of #RanaPlaza it is long overdue! #cleanclothes’, it was reported that they closed down their twitter account for the day, such was the force of the public’s social media pressure. Although Fashion Revolution was in large part an online campaign, supporters didn’t just take action on the blogosphere. Across the world people took to the streets and the shops in their thousands. 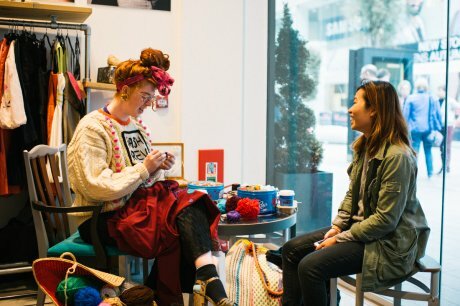 Whilst students from University of the Arts London created a flashmob on Oxford Street asking passers-by to go #insideout for Fashion Revolution Day, some of us chose a more sedate way to campaign and celebrate the day with workshops, pop-ups and panel discussions. 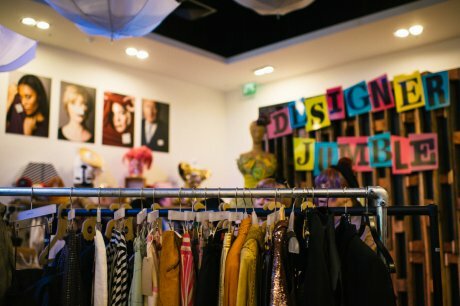 The Good Wardrobe collaborated with Designer Jumble who hosted a wonderful all-day event at their Westfield pop-up shop. Whilst we got on with mending and sharing sewing skills, designer Katie Jones (above) from K2TOG embellished a moth-eaten vintage Jean Paul Gaultier jumpsuit, FutureFrock founder Alice Wilby showed shoppers the delights of ethical designers and Susie Lau of Style Bubble dressed a mannequin in second-hand designer garments, all of which further proved that you can still follow fashion and be ethical. Like Scott-Heron’s revolution, ours is a fight for equality. We want respect for the people making our clothes and consumer goods. It is not enough to sit and watch one garment factory collapse after another unfold on the news and think, “gosh how awful!” and then turn a blind eye “because, well – they don’t really have anything to do with me do they? Besides, there's nothing I can do anyway”. You are in the driving seat – if you feel uncomfortable with the knowledge that people might be dying to make your clothes and you think something should change then don’t just sit there - join the revolution. As it happened, because of the huge public interest, the revolution was televised and covered across the majority of the broadsheets and mainstream fashion publications including Vogue.com, Marie Claire online, LibertyLondonGirl and Style Bubble, as well as news sites likes Reuters and the BBC. The #insideout campaign is still going strong so if you haven’t yet taken part, it’s not too late. You can even nominate a friend to take part via Facebook. 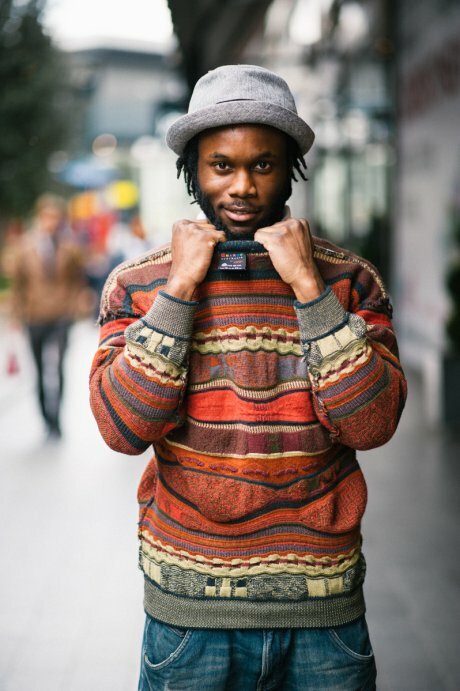 A crowdfunding campaign has recently launched - to help the next stage and you can support the movement from as little as £5 and receive one of many fair fashion rewards: www.indiegogo.com/projects/fashion-revolution-a-global-movement. The Fashion Revolution on 24th April was indeed ‘live’ but it was just the beginning – it will keep on growing. ‘The revolution will not be right back’. I want to say a huge thank you to Abi Chisman and her team at Designer Jumble, as well as the amazingly talented makers and menders who joined me on the day to share their skills: designer Tola Mohiki, Juliette Stuart (founder of Only Denim) and designer / pattern-maker Emily Hundt. To see some of the ‘before’ and ‘after’ images of the Fashion Revolution Day mending that we did at Designer Jumble please visit out Facebook page.